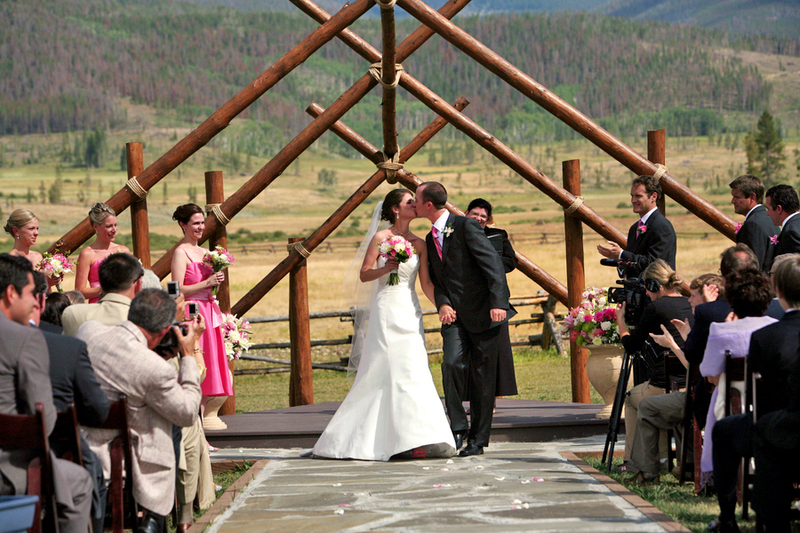 The great outdoors offer an endless variety of themes & innovative backdrops for your wedding day. The advantages of having your special day outside are plentiful: abundant space, natural appeal and sun, sun, sun – just to name a few! Of course you’ll want to ensure your locale has adequate shelter and restroom facilities, along with other logistical concerns. But once these are accounted for, only your imagination and creativity will limit your outdoor wedding possibilities. Having your wedding outside will produce unforgettable memories of your special day – and here are a few locales & themes to get you started. You’ve probably heard this term before: a rustic outdoor wedding. What exactly is a rustic setting? Whatever and wherever you wish. You can choose a country inn, a forest gazebo, rural church and much more. For true outdoor diehards, even your favorite campsite would suffice. You’ll want to have your rustic wedding far enough from urban landscapes for a remote feel, yet with adequate amenities to avoid inconveniencing your guests. Each aspect of your wedding – clothes, favors, food selection and more – can greatly contribute to rustic-themed ambiance. For attire, try traditional period clothing instead of traditional tuxedos and dresses. If you’re at a countryside barn or hotel setting, for example, simple denim and plaid shirts for the guys and quaint dresses for the ladies can set a wonderful tone. For the more traditional couple, a wedding gown and tux can actually provide an interesting contrast when juxtaposed with a rustic setting. Wedding favors should trend toward more rough-hewn craftsmanship and other hand-made items. Miniature furniture, lanterns and floral-themed favors add charming appeal and give all your guests a memorable keepsake from your wedding. Local caterers should be preferred for rustic weddings, especially if your locale is in deep rural areas. While trendy cuisine is always a favorite with newlyweds for reception fare, home-cooked meals are better suited for country & rustic weddings. Enhance the rustic wedding theme with local musical entertainment. Bluegrass and contemporary country are the perfect complements to an evening of rural revelry. Live music gives your outdoor wedding authentic ambiance and works better than recorded tunes. Increasingly popular and more fun than you think, sports venue weddings are quickly becoming a favorite outdoor nuptial locale. If you and your future spouse are fans of a particular team, contact their facility management for rates & availability. MLB and NFL stadiums are well-appointed with caterers and plenty of amenities for guests of all ages. Even smaller venues like minor league baseball fields can have all the benefits of the “big leagues” at a greatly reduced cost. Get into the spirit of your favorite team by wearing authentic apparel. If you have a football team themed wedding, gridiron jerseys are great ways to show team pride. Likewise, baseball hats provide a whimsical & sporting feel and display unquestioned spirit. 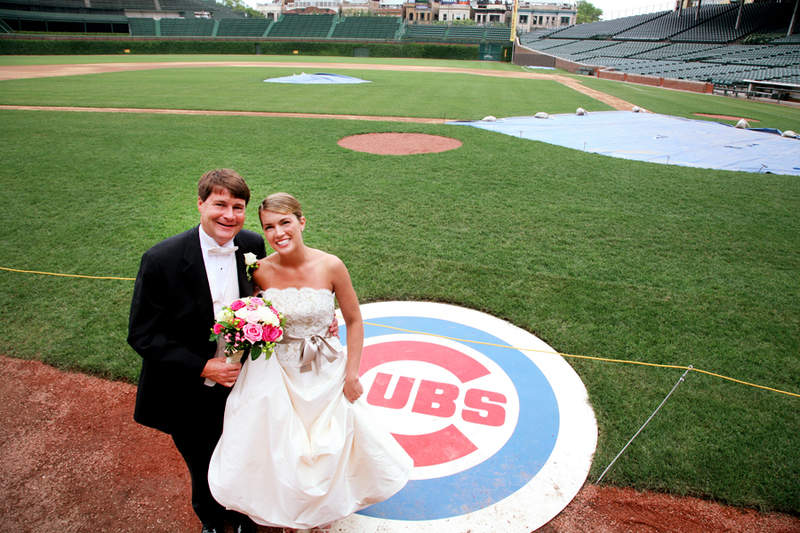 A sports themed outdoor wedding can offer ballpark food staples like hot dogs, popcorn and soda. Not only does this menu selection keep in line with typical sporting cuisine, it’s a sure money saver, too! If you do have your wedding at a professional sporting venue, you’ll have a bountiful selection of catered food at your disposal, sometimes provided by the same company that serves up gameday treats. Nachos, sandwiches, pretzels and more – this kind of informal fare is the ideal addition to your outdoor wedding. For memorable photography, be sure to get shots of home plate, the goal posts, end zones – whatever field attractions you prefer. Your photo options are literally endless; a wedding party of, say, 12 people can easily find the ideal picture taking spots in an empty 40,000 seat stadium! If you’re fortunate enough, try arranging a performance from the stadium’s announcer and / or organ player. This is an unforgettable way to introduce your wedding party – similar to announcing starting lineups on gameday. Your choice of favors at an outdoor sports wedding can go a long way in creating a winning style and make a lasting impression, too! You may want to offer baseballs marked with the bride and groom names, along with your wedding date. Mini football helmets, sports memorabilia and other similar offerings will be sure to hit a home run with your guests. Another advantage of sports stadium weddings is the quick access to shelter in case of bad weather. Most big league parks & professional stadiums offer easy access to your reception area. If rain or other inclement weather threatens your outdoor sports nuptials, simply move inside. You can still enjoy a view of the field and maintain the ambiance and fun you’ve worked hard to create.